Originally uploaded by Master and Commander. My son's message to the world right now. This is both strange and hillarious. Boy, how times have changed in thirty years. Rock and Bea, singing nostalgically about getting high, you gotta love it. Lights' excellent production of "Jesus Christ Superstar." ever undertaken.'' But some skepticism might surround the production. extravaganza might seem beyond the means of the tiny San Jose troupe. O, ye of little faith: Suspend that disbelief. set itself is as humble as a rural church. origins and is not worth producing anymore. guitarist brothers Bill and Tim Rupel. but still present in good theater. a song that many consider a mawkish cliche epitomizing a mawkish era. Webber's inventive score. But that ``tribal musical'' truly is a relic now. anyway, it doesn't let go. Contact Colin Seymour at cseymour@mercurynews.com or (408) 920-5857. 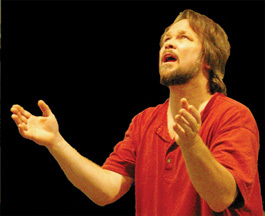 DIRECTING the City Lights Theater Company production of Jesus Christ Superstar, artistic director Lisa Mallette's collaborative style goes well with jazz-minded musical director Gus Kambeitz. He and Mallette have updated parts of Andrew Lloyd Webber's funky rock opera with the occasional hip-hop beat, a smattering of rap and a dynamic range that goes from big production to "unplugged." Both directors wanted the feel of a rock concert while highlighting a very human drama (as opposed to pyrotechnics). Since Kambeitz plays bass through most of the show, he is not there to cue performers in and out of his layered vocal arrangements and Webber's complex time signatures. On the one hand, that has unsettled a few performers who like every cue scripted. On the other, as Kambeitz points out, characters won't have to keep looking up for musical direction. "We've freed them up to just act. ... There's a little more flexibility." We open on Saturday, which is sold out. You can come to a pay what you can night tonight, Thursday July 13, and I think that if you call the box office you can get a ticket for $5.00 for tomorrow's preview. What a wonderful rich and multi-layered play this is. Rarely have I seen a new play that is so well written. The acting and directing are superb. You have one more weekend to see this thoufhtful and toouching new play.